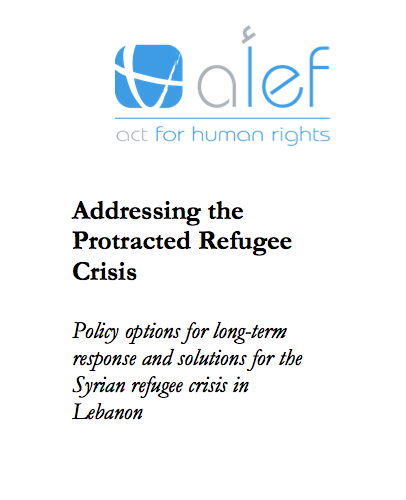 This paper seeks to analyse and present policy options for long term solutions to the Syrian refugee crisis in Lebanon. These options stem from rights standards, and take into account the political, social, and economic challenges that Lebanon suffers from, including those created or exacerbated as a result of the crisis. Undergo a thorough review of the Syrian Refugees status determination to distinguish the persons of concerns (i.e. in need of refugee protection) among the larger Syrian community in Lebanon (mostly Syrians seeking better economic opportunities but not necessarily in need for refugee protection). Resettlement: Discuss other forms of admission plans with other countries in need of labour, even if on temporary basis including customised resettlement plans based on the needs of refugees and economic capacities of these countries. Voluntary Return: Utilize its position and role in the global discussions on the Syrian conflict to ensure refugee return measures are part of the on-going negotiations in particular those in relation to the de-escalation zones in Syria. Temporary Asylum: The Government of Lebanon to reform measures applicable to Syrian refugees allowing the latter population to receive proper protection and dignified temporary asylum in Lebanon until their resettlement or return.